Do not just go out and buy a gun unless you are ready to spend a lot of time with it. Owning a gun is a dangerous liabilty if you do not correctly know how to use it, you don't properly practice/train with it regularly, and you aren't willing to use it against another human being in a time of crisis. It is extremely true that you cannot just carry a gun around with yourself and expect it to protect you if you haven't done extensive training with it. I will strongly agree with a reader who said "without the proper defense training, a gun at best provides a false sense of security." If you are not able to access your gun fast enough, you aren't familiar enough with it, you are a bad shot, or you fumble with your gun while struggling with a perpetrator, you might (and probably will) just get yourself (or an innocent bystander) shot. Being scared into the idea that you may someday need a gun to protect yourself is NOT the only reason that you should develop an interest in guns. It may be the thing that first gets you thinking about guns, but there is so much more to gun ownership than that. Our 2nd Ammendment right to bear arms is constantly in limbo of being taken away from us, not to mention that shooting guns can just be a lot of fun. There are lots of sport-shooting events, programs, and competitions out there. Lots of marksmanship training courses to be apart of. Lots of ranges and gun clubs to join. Lots of major gun shows to attend. Lots of products to check out. Lots of gun magazines to read thru. Not to mention, if you have a gun, you can go out into the woods and shoot yourself a meal if you're hungry and desperate for food. Ok, someone asked me about my shooting experience, so I guess I'll move onto that. Once I became interested in guns, I did alot of online research, reading about different rifles and handguns. I mainly wanted to figure out which ones wouldn't have much recoil and would be good for just starting out. I then got a membership at the local gun club and began trying out different rifles that people had at the range. I shot a lever-action 30-30, pump-action 22 magnum, bolt-action 243, semi-auto 223, and a Ruger 10/22. I haven't shot a muzzle-loader, yet, or a shotgun, although I'm sure I will soon enough. As for handguns, I've shot quite a few. I've got my concealed pistol license and personally own a Smith & Wesson Model 63 (22 revolver) and a Ruger LCR (lightweight carry revolver) (38 special). The 38 special is my concealed carry pistol, and my 22 is just a kit-gun for field use/plinking/target practice. I've also put several rounds through a Ruger SP 101 (using 38 and 357 magnum ammunition), a Sig Mosquito 22 automatic, a Springfield XDM 40 (40 caliber automatic), a Springfield XDM 9 (9mm automatic), a Glock 17 (9mm automatic) and a Smith & Wesson 38 revolver. Rifles: The Ruger 10/22 (shoots 22LR ammo) is my top pick, followed by the Ruger Mini-14 (shoots 223 ammo) and the Savage 243. Handguns: I love both my LCR and Smith & Wesson Model 63. The recoil with my LCR can be a little rough, but I just love how lightweight it is for everyday carry. I don't own the Springfield XDM 9 or the Springfield XDM 40, but they were both very comfortable to shoot. I wouldn't mind owning a Springfield XDM 9 (20 capacity! 19 + 1 in the chamber). I would also really love to try a Springfield EMP. Anyone have any experience with one of those? Training: I head to gun ranges alot, in fact I just went to a new one today that was indoors and had different automatic moving targets to shoot at. Fun fun fun. Practice practice practice :) Training isn't a chore, it is a fun thing to do. Especially when you are out in the woods, plinking with your friends, on a warm, sunny, afternoon. As long as you know what is beyond your target and you have a good backstop, shooting at bottlecaps, milkjugs, and popcans make for excellent practice. I also took an NRA home-defense course, with range time, in order to get my CPL. Ever since this ruling, it's safe to say that individual gun rights aren't going away any time soon. Nice to read your thoughts. My girlfriend's pistols are a S&W 4516 and a Taurus M85. She's pretty hip to the AR15 as far as rifles go, she is on our website pic-wise www.milcopptactical.com taking our rifle course. Also, while *Heller* does grant us the right TKBA in some ways, it also leaves it open for the states to regulate just what kind of firearms we can own (California safety restrictions come to mind off the top of my head) and the restrictions that can be placed on us (magazine limitations as well type of ammo--NJ, NY and others). This was clearly stated in the closing comments of Heller. These are some of the loopholes that the NRA is trying to close with the Chicago suit. Regardless. I have to say that it is good to see that you've overcome the basic fears that seem to stop many from even trying shooting as a sport, not to say as a defensive alternative to 911 as well. IF you ever get to Ohio look us up, Shorty and I are always willing to go shooting. Luke - interesting link, thx for sharing. I do really hope that our gun rights aren't going away any time soon. Guntard - I really like both your sites, I have linked to them on my firearms links page. I think your shooting drills are excellent, I am going to incorporate some of those techniques into my practice. That is also interesting for me to hear about what guns other women choose to use and carry. I've never shot a 45 yet, but I'd like to. Your girlfriend likes hers pretty well? Guntard - I'd also really love to shoot an AR15, although I don't know anyone who has got one. Nice to hear someone emphasize the training aspect of defensive arms. Personally, I primarily shoot rifles for competition and fun, and am not trained in defensive handgun use. So, in the city, I keep my guns unloaded and locked away at all times. I have neighbors and roommates behind thin walls, and I'm simply not going to discharge a firearm in that kind of environment no matter what. My white oak staff and aikido training will have to do. On my property, I had a 9mm (Sig P6) strapped to my leg, but even then, kept the chamber empty. If I didn't even have the 1 second it takes to rack back the slide, I was probably in way over my head. Not to mention, a 9mm is a little underpowered. A 12 ga shotgun would probably be a better choice. Though, on lonely dark nights, when mysterious lights danced on the other end of my property, it sure was comforting to have my Sig at my side. She loves her .45. It was the choice in a long line of pistols that we shot from Glocks to Hi-Powers to Sigs to 1911's--you get the picture. Truth be told, what she really loves is the 1911, but with her small hands, she just has a hard time working the thumb safety. She went with the S&W since the controls are ambi and she can operate them with her left thumb while still maintaining a master grip with her primary hand. The only problem we've run into with the S&W is that holsters are getting hard to find for it--especially lady holsters. Right now she's using it in a drop-leg holster, but has a belt slide for it. The .45 has a recoil pulse about like a 9mm to tell the truth. It's a little stouter, but spread out from beginning to end, not at all like the .40SW with a very sharp recoil pulse. I bought it for her for Mother's Day a couple years ago. The Taurus was mine at one time--I carried it as my back-up while on duty and had several custom features added to it that were not available from the factory at the time I carried it. I gave it to her for her birthday when we first started dating and she also loves shooting it. The .38 is her bedstand firearm. If you make it up to Seattle we are going shooting. You can even stay on my land for a while...Riverfront! Ryo - thanks so much for your comments! I definitely hear what you're saying about not using a firearm in that kind of environment.. One thing to think about (if carrying a handgun in an urban setting) would be to use frangible ammunition, such as Glaser Safety Slugs. Here's a link about frangible ammo: http://www.globalsecurity.org/military/systems/munitions/frangible.htm I have some Glaser Safety Slugs for my 38.. They were expensive, like 2 bucks per round, but they seem quite good for that kind of environment. I also agree that when on your own property, a 12 gauge shotgun would be so much better protection than your 9, but 9mm handguns do have more stopping power than they get credit for. And really, accuracy (in my opinion) is more important than stopping power. I would love to have a 9mm. Just haven't found one that is both extremely reliable and a good size grip for my tiny hands. Also not sure if I want to compromize size (concealability) for higher mag capacity. Still deciding. No hurry though. Guntard - I have heard that before, that a 45 is more comfortable to shoot than a 40... that a 45 is pretty comparable (recoil-wise) to a 9mm. I'm just torn between the power of a 45 and the higher capacity of a 9mm. I also have small hands and difficulty with operating many thumb safeties, along with the fact that I like the style of the 1911. That is why I'm interested in maybe trying the Springfield EMP (enhanced micro pistol). It is a smaller 1911 that was redesigned for 9mm (or 40). As for AR15s, I would just love to shoot one. I've held one and love how lightweight and small they are for how powerful they are. A lot of brands make the AR15, right, although it was originally made by Colt? Is there a brand you would recommend? I will definitely keep checking out your site, by the way, I'd LOVE to take a course. Ohio is not that far away from me and I drive thru anytime I head south. I really do love your sites and could definitely use some training. Jeff - sounds great, lol. Email me your contact info, I'll put you in my notebook! Just picked up a Glock 26. It is practically invisible and has more firepower than a subcompact Ruger LCP .380. My first impression of this blog is that you were a hippie waving in the wind, but I really admire your practicality and focus on guns lately. Red - hey I really appreciate that. I think alot of people probably think I'm a hippy waving in the wind. I honestly am not that at all, although I'm sure my lifestyle seems to reflect that. Glad you like the gun stuff! I have no idea how many readers here are into firearms. . . I sure enjoy shooting mine though. I've looked at/held the LCP, but I got the LCR b/c I wanted a revolver and I wanted more power. Do you like the Glock 26 so far? I watched one of the Glock 26 videos on youtube. If you are ever in Florida. The wife and I have a plethora of AR's and other such guns. If ya ever want to shoot we are down. he customizes glocks. Feel free to drop me a line at sniper2_69@yahoo.com. You sound like you have a good head on your shoulders, your posts show a lot of common sense. The EMP is a really nice pistol, very small, accurate, but over $900 the last I checked. My wife prefers the Kahr line of 9mms, which are in the same or smaller size range. Should you decide to get a full size pistol the Glock 9mms would be hands down the best choice. I'm glad to see you haven't fallen into the caliber debates. The truth is that 9mms work just as well as any of the other service calibers, and that all pistols shoot relatively puny bullets compared to rifles and shotguns. Anon/Jarrad - sweet! Where in FL? I know that state better than I know my own. and thx for the links, I will check them out. Chuck - yeah the EMP is a bit pricey, cool & reliable as it is. I will check out the Kahrs. Also I've shot a Glock 17, and it was ok, but the grip was way too big for my little hands. As for calibers, I agree! I personally think that any caliber can be used for self-defense. No matter what caliber, a gun is a definite deterrent. As for stopping power, a 22 can be deadly. If you are accurate and know where you are putting the bullet, what does it matter what caliber it is. In my opinion. 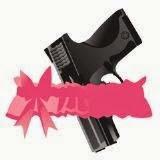 After reading your post I strongly felt that someday girls may need a gun to protect themselves from social devils.